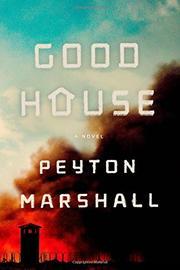 Marshall’s debut imagines a near-future America in which the environment is degraded, the social fabric is unraveling, and foreign wars are never-ending. Sound familiar? James is one of the young boys placed in the Goodhouse system when mandatory genetic testing reveals he has “certain biometric markers” common in violent criminals. Raised as wards of the state, James and his fellows are trained in “right-thinking” so they can be released at 18 to join society, though only those with Level 1 status will be fully assimilated. Meanwhile, they’re subject to the arbitrary, brutal supervision of proctors and class leaders. And recently, a group of religious fanatics called Zeros has been attacking Goodhouses, claiming the boys are unredeemable and must be killed: “Only then would the oceans teem once more with life…the weather normalize…would there be peace.” It’s a good setup, and Marshall gives us an appropriately troubled protagonist, haunted by memories of the deadly Zero attack on his former Goodhouse in Oregon. Relocated to Ione, California, James soon gets into trouble thanks to his encounter on Community Day with a civilian girl named Bethany; she’s contemptuous of the pieties James carefully utters and encourages him to break the rules. Far more dangerous than James’ attraction to Bethany is his tangled connection with her father, Dr. A.J. Cleveland, a researcher (and covert Zero ally) at the Ione Goodhouse who protects James only because he needs a guinea pig for his dangerous drug experiment. The plot moves briskly, with James and his friend Owen losing their Level 1 status and sinking into the Goodhouse depths while Zero activity becomes more aggressive, culminating in an attack on Ione. A cautiously optimistic ending offers some hope but shows this world still insecure and unjust. Well-plotted and written but lacking any truly original spark that would distinguish it in the increasingly crowded genre of dystopian fiction starring hard-pressed young adults.